okay, i went to this house party at bf paranaque last saturday and i met some new people. and as always they end up guessing that i am over twenty (22-23, may humabol pa na 24). attention everbody: i am only 19.
hmm.. i need to do something. my bestfriend says it's because i am so tall. ferk. being tall has it's downsides. speaking of work, i have been fortunate enough not to get observation scores less than 90% both from atlanta and from the local QA's. hopefully i maintain this by the end of feb, para medyo palarin naman tayo sa commission. hehe. moolah baby. i don't like money like, like it like it. but hey, more money won't hurt yah huh? huh? kapish. but i am missing school just a tad more than usual. ugh.. i miss how it is when when all you are worried about are homework and projects, not your AHT and your obs scores. maybe i am getting nostalgic since every sundays they play older songs. yep, them sunday songs always get into my head. plus i went and played the guitar. wah. nostalgia pare. hating it and loving it at the same time. hating and loving. i am getting confused. grr! i cannot like someone. i just can't. give me a week or two and this'll be gone. i swear. i'll bet my little sister for it. anyway, there you go. more ranting when i get a chance to and oh i'd be ranting a lot. toodles. i have had, in my two week history of being a customer service representative, my WORST day of taking calls this morning. i have dealt with variable rates of stupidity, often times with a splash of anger and irritation. i hate it. even chocolate didn't cheer me up. i am frustrated. at kamusta naman ang last two calls ko na mannual authorizations, with both cardholder and merchant on line. to the people who understand call center jargon, you know what i mean. bulldung. anyways, i'll tell you something about friday. i mean, last friday. alright. i went out with friends last friday at timog (Deep). and i planned to party all-out, since i never had courage to do so. so there we were, drinking vodka mixes while waiting for the party to start. soon the dancefloor was crowded and i went in to dance. i NEVER thought i could do this, but i danced with a guy and a girl at the same time. call me innocent but this is something new to me. so it was me, girl, then guy. okay, so we danced on the circle thingy that they put up so we were raised and everyone could see. i was sweating and everything, but i thought what the heck i'm having fun. i never remembered the girls name though. he danced near me and i was moving my head with the beat and when i was actually going to try to come up to him and dance, one of my friends pulled me away. dang! missed connection pare. anyway, since my connection was lost i sat down to drink a cuppa. and then i noticed that one of my friends is missing. i went to look for him and found him sitting alone in the room with a lot of pillows (i do not know what they call it). he looked devastated so i sat beside him to try to talk. and apparantly, as i have assumed, my friend has the love aches. you see, this is the reason why i said no boyfriends till 20. my friend here has been struck dumb by love. i understand how this might happen (yeah, the experience blah). i don't know if being indifferent to love is a good thing, but this is how i am now. i tried to drill in some sense into my friend. i told him that he deserves a lot better than being another option on another guys list. i told him that he must take care of himself first. i told him how good he was and how happy he was before he met the guy. i told him that he could always live without the guy, since he was doing it before they met. but i might have talked to a cat for all the better, because my friend wasn't listening. but i tried to soothe him, i know how painful it is. heart aches. tsk. and as Valentine's Day looms, i leave you with something from Pablo Neruda, one guy who's a big inspiration to how i write. Have neither voice nor sight. I have forgotten your eyes. Make to me an irreperable harm. Glimpse you in every window. so goes one of my calls. yes guys, FINALLY. i am now a full-pledged inbound customer service guy. and what fun it is to take 'em calls. joy in my heart. and my schedule is super great. i am in at 12pm EST and would be out at 9pm EST. so that'll be 1am to 10am manila time. saya no? anyway, the good thing is i have been assigned to the cutest team leader i've ever seen (and so far i have around ten, hehe). he is so mabait. because i am the youngest *ahem* and the most inexperienced *ahem ahem*, he has taken to teaching me everything about the csr world, compucredit style. the downeside here is that i feel like i am back in gradeschool with a tutor (which has never happened cuz i never had a tutor), but then i get to sit with this cute TL of mine and make sure that my stats for work is good. so basically that is my current work status. oooh ooooh, right. i was asked thrice by them yuppies to have coffee with them. big surprise when they found out that i am from the philippines. weirdos. on the other hand, my social life is turning out to be exciting. i have now resorted to watching movies alone. ALONE guys! imagine me sitting inside the movies, eating my big fries and drinking my big iced tea while randomly looking at couples who are making out by the sulok of the movie house and seeing friends make kwento and comments about the movie. exciting. 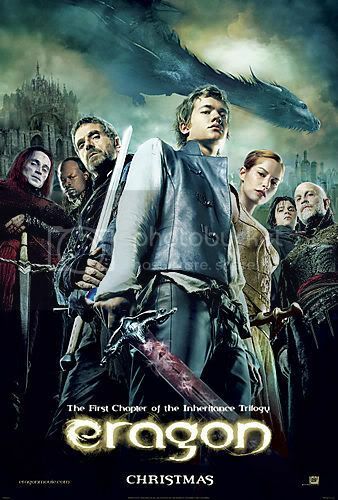 anyway, the latest movie (which in itself has a double meaning, go figure) is Eragon. i have toiled in my waking hours and read the book itself. i always make it a point to read the book before i watch the movie. anyway, the book was good. really. i liked it. the scenery and the action was enough to keep me reading for hours. 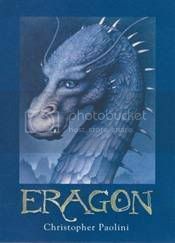 a bit weird, yes, the way Saphira and Eragon communicate (parang text messaging, naghahanap pa ng signal-may mms sending pa) but the whole package is a-ok.
i especially like the ancient language stuff. sounds really elvish-and i like elves. and no, hindi siya Christmas lumabas. anyway, the movie was &*#$@!!%!!! i do not know what i typed in, but i think it might say the movie ain't good. nuh-uh. no good at all. the story flow was wrong. the scenes were wrong. the characters were wrong (Arya, she's an elf! where are the pionted ears? asan?!). the movie was wrong. i may not be good at making movies (duh? ), but at least they could've tried to live up to the book. if rated, out of five the book gets 4 and the movie gets 1.78. there. it's my off till saturday. i will (i think) watch another movie. that's it for now. toodles.